Background: Acute coronary syndrome (ACS) is the most prevalent cardiac disorder. Adjunctive pharmacotherapy has proved to be safe and effective in treating patients with this syndrome. Underutilization of such pharmacotherapy was reported in different studies. 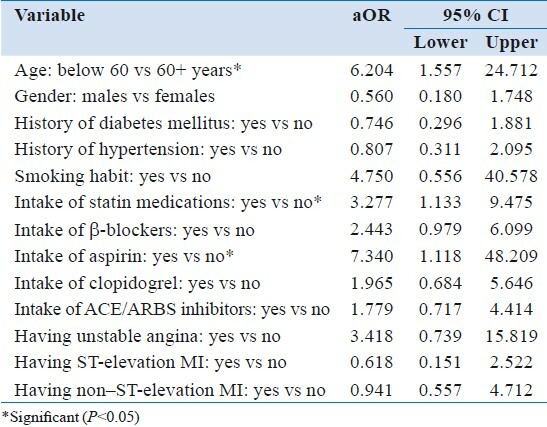 Objectives: In this study, we evaluated the underutilization of these pharmacotherapies on patients admitted to Aseer Central Hospital (ACH) with ACS, find out factors that may predict utilization of these therapies, and determine the effect of such pattern of drug utilization on survival at discharge. Materials and Methods: A retrospective cohort of 562 patients admitted with the diagnosis of ACS to ACH during the period from March 2007 to February 2009 was studied. Results: β-blockers (B-blocker) and angiotensin-converting enzyme inhibitors (ACEI) were used in only 69 and 59% of cases, respectively. Aspirin, clopidogrel, and statin were used in 98.4, 82.6, and 89.3% of cases, respectively. The presence of diabetes predicts the use of ACE inhibitors, whereas the diagnosis of unstable angina and ST-elevation myocardial infarction predict the use of statin. Survival rate at discharge was 95.6%. Use of statin and aspirin improved survival. Conclusion: Certain adjunctive pharmacotherapies were underutilized in ACS patients in Southwest region, Saudi Arabia, specifically β-blockers and ACEI. Standard of care should be revised and updated, aiming to improve adherence to guidelines of management of patients with ACS. ACS includes ST-segment elevation myocardial infarction (STEMI), non-ST-segment elevation myocardial infarction (NSTEMI), and unstable angina. Adjunctive therapy for ACS includes antiplatelet therapy, beta-adrenergic blocking agents (β-blockers [β-blockers]), angiotensin-converting enzyme inhibitors (ACEI), and lipid-lowering agents (statin). Several guidelines were established to improve care for ACS patients. , These guidelines emphasizes the importance of using these pharmacotherapies in managing patients with ACS. The Aseer region (population of 1 200 000) is located in the southwest of Saudi Arabia, covering an area of more than 80 000 km 2 . The region extends from the high mountains of Sarawat (with an altitude of 3,200m above sea level) to the Red Sea. Health Services delivery in the Aseer region is provided by a network of 244 primary health care centers, 16 referral hospitals, and one tertiary hospital, Aseer Central Hospital (ACH). ACH, with 500 beds, is run by the Ministry of Health and the College of Medicine of King Khalid University (KKU), Abha. This study tried to establish the pattern of utilization of adjunctive pharmacotherapy for patients admitted to ACH with the diagnosis of ACS, find out how close we are to optimal care, determine the different variables that can affect this pattern, and evaluate the effect of this practice on survival at discharge. This study was a retrospective cohort of all patients admitted to ACH with the diagnosis of ACS for the period between March 2007 and February 2009. Patient's data were reviewed and tabulated, including demographic data, coronary risk factors, different adjunctive pharmacologic agents used, and mortality records. Data were analyzed using SPSS software package. Approval of the local medical-ethical committee was obtained. The present study included 562 patients with the diagnosis of ACS, 407 (72.4%) were men and 155 (27.6%) were women. The age ranged from 26 to 100 years with an average 60.6 ± 13.7 years and a median of 60 years. The majority of cases were Saudis (502, 89.3%). The distribution of diagnosis was unstable angina (UA) (307, 54.6%), ST-elevation myocardial infarction (190, 33.8%), and non-ST-elevation myocardial infarction (65, 11.6%). More than half of the patients (287, 51.1%) were diabetic. More than one-third of the patients (216, 38.4%) were hypertensive. 18.9% (106) were current smokers. The present study included observations on the following adjunctive pharmacotherapies: Anti-platelet therapy (aspirin and clopidogrel), β-blockers, ACEI (or angiotensin 2 receptor blockers for patients intolerant to ACEI), and lipid-lowering therapy (statin). Aspirin, clopidogrel, and statin therapies were given to the majority of patients (98.4, 82.6, and 89.3%, respectively). On the other hand, β-blockers and ACEI (or angiotensin 2 receptor blockers) were given to a less proportion of patients (69 and 59%, respectively). [Table 1] shows logistic regression analysis to identify potential factors affecting intake of different adjunctive pharmacotherapies among ACS patients in southwest Saudi Arabia. Patients with the diagnosis of UA have significantly 9.8 times the chance of being on statin therapy compared to patients without the diagnosis of UA (adjusted odds ratio [aOR] = 9.803, 95% confidence interval [CI] = 1.312-71.42). Patients with the diagnosis of STEMI have significantly eight times the chance of being on statin therapy compared to patients without the diagnosis of STEMI (aOR =8.064, 95% CI = 1.052-62.5). However, diabetic patients are more likely to be on ACEI (aOR = 1.496, 95% CI = 1.055-2.121). Of all, 25 patients (4.4%) died and the rest were discharged alive. [Table 2] shows logistic regression analysis to identify factors associated with survival. Patients younger than 60 years of age have significantly 6.2 times the chance of survival compared with patients aged 60 years or older (aOR = 6.204, 95% CI = 1.557-24.712). Patients receiving aspirin had significantly 7.3 times the chance of survival compared with those not receiving the drugs (aOR = 7.340, 95% CI = 1.118-48.209). Similarly, intake of statin was found to be significant in affecting the survival (aOR = 3.277, 95% CI = 1.133-9.475). On the other hand, the rest of medications, gender, and medical and family history were of no significant value in affecting survival. On the other hand, the uses of other adjunctive pharmacotherapies, specifically aspirin, clopidogrel, and lipid-lowering therapy (statin) (98.4, 82.6, and 89.3%, respectively) were optimal and in concordance with the international recommended guidelines. The underutilization of β-blockers and ACEI can reflect on patient's survival. Such underutilization is a multi-factorial problem and may stem from misperceptions regarding drug safety profile or from concerns about adverse effects. Other reasons may be related to patient's compliance with treatment and physician's attitude in complying with the evidence-based practice. Compared with the reported international experiences, our local Saudi practice suffers a similar problem (although to a lesser extent) of adherence to the recommended guidelines. This is the first study in Saudi Arabia that aimed to examine the pattern of utilization of different adjunctive pharmacotherapies among patients with the diagnosis of ACS. The study showed underutilization of β-blockers and ACEI in managing ACS patients. This study hopes to improve medical care by raising awareness of this problem. Physicians are urged use all pharmacotherapies that have been proven to be effective and safe in treating patients with ACS. 1. Pollack CV Jr, Braunwald E. 2007 update to the ACC/AHA guidelines for the management of patients with unstable angina and non-St-segment elevation M.I., Implication for emergency department practice. Ann Emerg Med 2008;51:591-606. 2. Manson JE, Tosteson H, Ridker PM, Satterfield S, Hebert P, O'Connor GT, et al. The primary prevention of myocardial infarction. N Engl J Med 1992;326:1406-16. 3. Avezum A Jr, Flather M, Yusuf S. Recent advances and future directions in myocardial infarction. Cardiology 1994;84:391-407. 4. Heart and stroke facts. Dallas: American Heart Association, 1992. 5. Moss AJ, Benhorin J. Prognosis and management after a first myocardial infarction. N Engl J Med 1990;322:743-53. 6. Baigent C, Collins R, Appleby P, Parish S, Sleight P, Sleight R. ISIS-2 (Second International Study of Infarct Survival) Collaborative Group. Randomized trial of intravenous streptokinase, oral aspirin, both, or neither among 17,187 cases of suspected acute myocardial infarction: ISIS-2. Lancet 1988;2:349-60. 7. Hjalmarson A, Elmfeldt D, Herlitz J, Holmberg S, Málek I, Nyberg G, et al. Effect on mortality of metoprolol in acute myocardial infarction: a double-blind randomized trial. Lancet 1981;2:823-7. 8. Å Hjalmarson, MD (chairman), MIAMI Trial Steering Committee MIAMI Trial Research Group. Metoprolol in acute myocardial infarction (MIAMI): a randomized placebo-controlled international trial. Eur Heart J 1985;6:199-226. 9. First international study of infarct survival collaborative group. Randomized trial of intravenous atenolol among 16 027 cases of suspected acute myocardial infarction: ISIS-1. Lancet 1986;2:57-66. 10. The Norwegian Multicenter Study Group Norwegian Multicenter Study Group. Timolol-induced reduction in mortality and reinfarction in patients surviving acute myocardial infarction. N Engl J Med 1981;304:801-7. 11. b-blocker Heart Attack Trial Research Group. A randomized trial of proprnolol in patients with acute myocardial infarction, I: mortality results. JAMA 1982;247:1707-14. 12. Fourth International Study of Infarct Survival Collaborative Group. ISIS-4: a randomized factorial trial assessing early oral captopril, oral mononitrate, and intravenous magnesium sulphate in 58 050 patients with suspected acute myocardial infarction. Lancet 1995;345:669-85. 13. GISSI-3 Collaborative Group Gruppo Italiano per Jo Studio della Sopravvivenza nell'Infarto Miocardico. GISSI-3: effects of lisinopril and transdermal glyceryl trinitrate singly and together on 6-week mortality and ventricular function after acute myocardial infarction. Lancet 1994;343:1115-22. 14. Scandinavian Simvastatin Survival Study Group. Randomized trial of cholesterol lowering in 4444 patients with coronary heart disease: the Scandinavian Simvastatin Survival Study (4S). Lancet 1994;344:1383-9. 15. Jeffrey LA, Cynthia DA, Elliott MA, Charles RB, Robert MC, et al. ACC/AHA 2007 Guidelines for the Management of Patients With Unstable Angina/Non-ST-Elevation Myocardial Infarction. J Am Coll Cardiol 2007;50:652-726. 16. Jean PB, Christian WH, Diego A, Eric B, Andrzej B, Francisco FA,. Guidelines for the diagnosis and treatment of non-ST-segment elevation acute coronary syndromes Euro Heart J 2007;28:1598-660. 17. Krumholz HM, Radford MJ, Wang Y, Chen J, Heiat A, Marciniak TA. National use and effectiveness of beta-blockers for the treatment of elderly patients after acute myocardial infarction: National Cooperative Cardiovascular Project. JAMA 1998;280:623-9. 18. McCormick D, Gurwitz JH, Lessard D, Yarzebski J, Gore JM, Goldberg RJ. Use of aspirin, beta-blockers, and lipid-lowering medications before recurrent acute myocardial infarction: missed opportunities for prevention? Arch Intern Med 1999;159:561-7. 19. Marandi T, Baburin A, Ainla T. Use of evidence - based pharmacotherapy after myocardial infarction in Estonia. BMC Public Health 2010;10:358. 20. Brotons C, Permanyer G, Pacheco V, Moral I, Ribera A, Cascant P, et al. Premise study group. Prophylactic treatment after myocardial infarction in primary care: how far can we go? Fam Pract 2003;20:32-5. 21. Rasmussen JN, Chong A, Alter DA. Relationship between adherence to evidence-based pharmacotherapy and long term mortality after acute myocardial infarction. JAMA 2007;297:177-86. 22. Yan AT, Yan RT, Tan M, Huynh T, Soghrati K, Brunner LJ, et al. Optimal medical therapy at discharge in patients with acute coronary syndromes: Temporal changes, characteristics, and 1-year outcome. Am Heart J 2007;154:1108-15.